Icebergs are normally white but occasionally they can be blue. 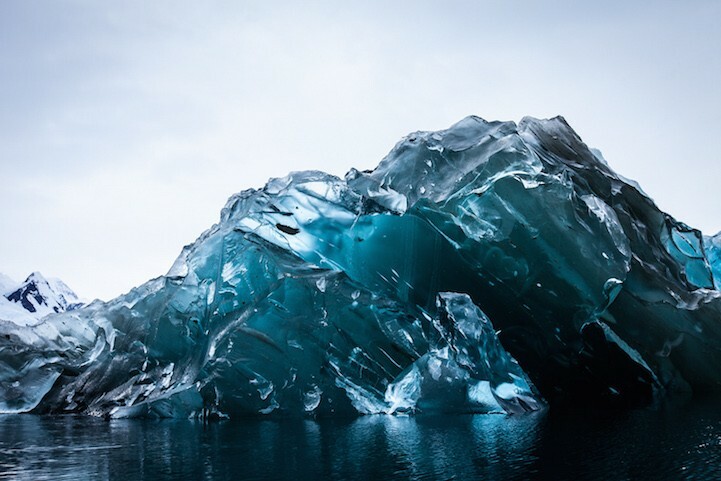 These spectacular photos of a blue iceberg were taken by filmmaker Alex Cornell in Antarctica. The iceberg had recently flipped over to reveal its vivid coloured underbelly. 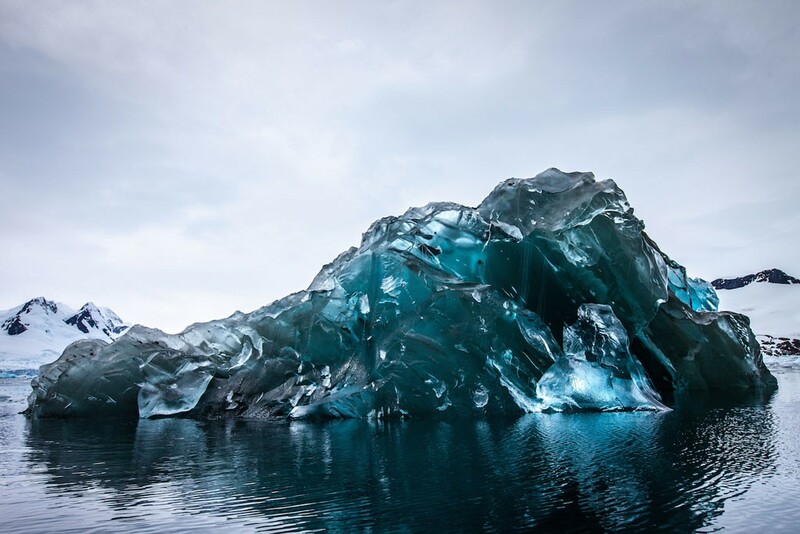 To find a blue iceberg is extremely rare. And Cornell felt lucky to be in the right place to capture it. Why are some icebergs blue? This is an interesting question and the answer has to do with the strange properties of light and how icebergs are made. Icebergs are “born” from glaciers, they are the result of glaciers reaching the sea and breaking off into large chunks of ice in process known as “glacier calving”. The glaciers themselves were created over thousands of years of snow falling becoming compacted and slowly growing to immense heights. Glaciers. Icebergs and snow normally appear white because although they are made from frozen water, when snow lands the unique configuration of snowflakes means that a lot of air gets trapped in-between the flakes. Snowflakes are like small frozen crystals – when light hits them it reflects light and shine, similar to the way a diamond sparkles. These sparked light hits the trapped air and so appears as white light. Icebergs similarly appear white for the same reason. 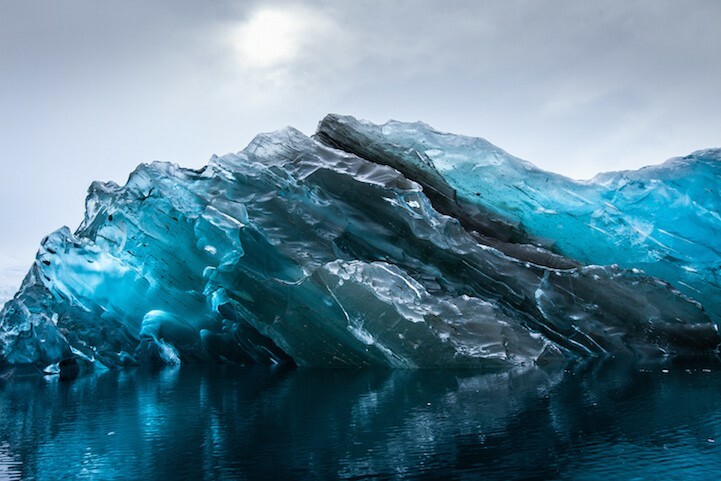 A blue iceberg occurs when it is made from a deep glacier that is thousands of years old. Over that large amount of time the weight of the snow and ice pushes down, squeezing almost all of the air out of the trapped snow. With no air the light that penetrates it cannot reflect back and so it no longer appears white. “Ok, so not white but why blue?” you may ask.Well blue is at the high end of the light spectrum and contains more energy so even with only a miniscule amount of air to reflect it, it has enough energy to bounce off. The strength of the blue wavelength of light is the reason that water in a swimming pool or in the ocean appears blue, whereas water in a cup appears colourless. Even then, the blue e.part of the iceberg is normally only revealed when the iceberg flips over to reveal its older more compacted bottom.